London and New York share a pair of Egyptian obelisks from Alexandria. At 69 feet tall (21 meters), this red granite tower or needle is a site to take in. It sits on the banks of the river Thames and is flanked by two bronze sphinxes. The need itself is right on the banks of the river on a pedestrian plaza and you may find it hard to get far enough back to get a full picture of the Needle. When you go to see the Needle you will notice scaring and cracks. These came from a German air raid during World War I. Londoners choice not to repair the damage, but rather keep it as a memorial to the event. Finding stories that your family is interested in and then visiting locations of those stories can really help with the imagination and excitement of the trip. To bring this monument to life consider reading with your family the Kane Chronicles by Rick Riordan. Obelisks, including this one, play an important part of that book series. You could also look at the Adventures of Sherlock Holmes or Stoneheart by Charlie Fletcher. 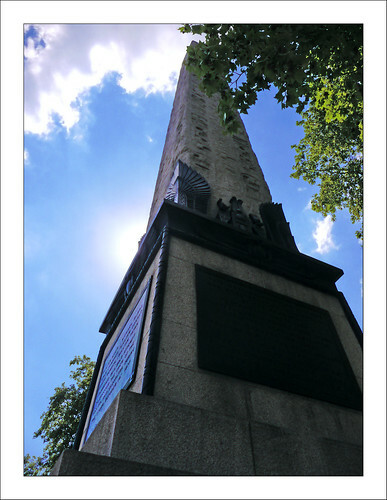 If the weather is nice spend a few minutes in the Victoria Embankment Gardens before crossing the street see the obelisk. Afterwards sit down and watch the boats come in and out of the three piers that are near this part of the Thames.